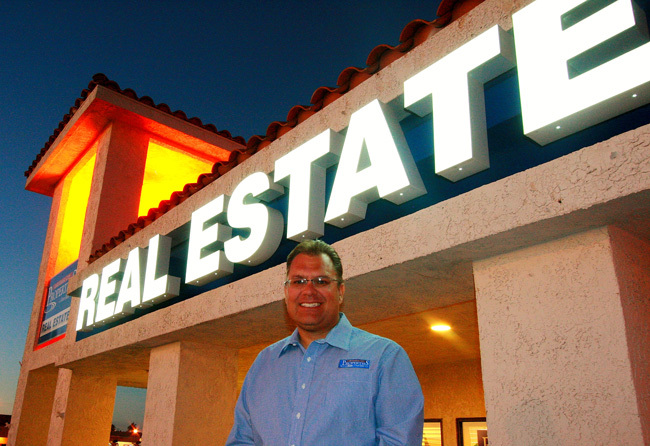 Dean Baker is the owner/Broker of Lake Havasu City Properties, located in the Safeway Shopping center. His real estate career spans 21 years as a full time Realtor in Lake Havasu City. When he began selling real estate, building lots could be purchased anywhere between $8,000 to $10,000 and brand new homes were $59,900, which included the lot. LM: How is business in the fall of 2012? DB: So far real estate sales are pretty strong, with approximately 100 homes selling in October 2012. Right now there are 290 single family homes “pending sale” or in escrow waiting to close. Fall is typically slower due to the fact that we are in a transition period, the summer visitor season is winding down and our winter visitors are not quite here yet. Our winter visitors are especially important to the Lake Havasu real estate market. Winter visitors, including Canadian buyers, have kept our real estate market strong by purchasing many of the foreclosure properties. LM: How did the housing crisis impact Havasu’s real estate business as well as home-building business? DB: Over the past 21 years I have seen three recessions or market downward trends, Lake Havasu real estate remained really strong through the last two; however this current crisis took its toll on us just like the rest of the country, we could not escape it this time. If you purchased a home between 2004 through 2007 you may have lost 40% to 50% of market value. New construction home building also dramatically slowed to a crawl. The good news is that it could have been much worse as seen in other communities throughout the nation. We continued to sell homes at a good clip through the entire crisis. Winter visitors, Canadians and investors bought up the hundreds of foreclosures that we had. The more foreclosures we have the weaker the real estate market is and in turn it lowers all of our home values. I am pleased to announce that at the time of this article there are only 52 single family foreclosures. People want to come to Lake Havasu City! I have always said where else can you buy a home with beautiful weather 8 months out of the year near a picturesque Lake in a clean low crime City for a great price, which is also in close proximity to a metropolitan City such as Las Vegas. We could even be more prosperous if we had a scheduled airline flight into our City. Many buyers especially our Canadian friends looking to relocate here desire to fly right into the City instead of flying to Las Vegas renting a car and driving here. This has caused us to lose some higher end sales. LM: How did the housing crisis impact Havasu’s real estate business, as well as the home-building business? DB: Over the past 21 years I have seen three recessions or market downward trends, Lake Havasu real estate remained really strong through two; however, this current crisis took its toll on us just like the rest of the country. We could not escape it this time. If you purchased a home between 2004 through 2007, you may have lost 40% to 50% of market value. New construction home building also dramatically slowed to a crawl. The good news is that it could have been much worse, as seen in other communities throughout the nation. We continued to sell homes at a good clip through the entire crisis. Winter visitors, Canadians and investors bought up the hundreds of foreclosures that we had. The more foreclosures we have the weaker the real estate market is; and in turn, it lowers all of our home values. I am pleased to announce that at the time of this article there are only 52 single family foreclosures. People want to come to Lake Havasu City! I have always said, where else can you buy a home with beautiful weather eight months out of the year near a picturesque lake in a clean low crime city for a great price – which is also in close proximity to a metropolitan city such as Las Vegas? We could even be more prosperous if we had a scheduled airline flight into our city. Many buyers, especially our Canadian friends looking to relocate here, desire to fly right into the city instead of flying to Las Vegas, renting a car and then driving here. This has caused us to lose some higher end sales. LM: Have building costs come down at all? Or are existing homes just more affordable? DB: Building costs have not come down, they have gone up. The cost of building a new home is primarily determined by material cost. Like everything else, material costs have also increased. Concrete is now selling for around a $100 per yard. Drywall, lumber and plumbing have also gone up. You will see the prices of new homes fluctuate based on vacant lot values. Lots available to build on in Lake Havasu City have swung from $20,000 ten years ago to a high of over a $100,000, and now they are heading back down to an average of about $50,800 at this time. With that being said, you can build a quality Energy Star certified home featuring three bedrooms, two baths and a two car garage with a tile roof and granite counter tops for about $108 per living square foot plus the value of the lot at the time. Existing homes are more affordable at this time; however, the prices are getting closer as inventory of existing homes decrease. Many people choose to purchase and build a new home because it’s new, energy efficient and you can get exactly what you want. LM: What are your projections for housing in Lake Havasu City in 2013? DB: I don’t have a crystal ball and I am cautious about making predictions but here it goes… I think we are going to have a very strong winter with about four to five homes selling in our city per day. This strong increase in buyer traffic will be bolstered by Canadian buyers. Canada has a strong economy and their dollar, or “Loonie,” is about par with our dollar. Home inventory is also low in our city as we head into the selling season. With foreclosures around 52, and the total single family home inventory down around 600, it only gives us a four month supply of inventory of homes. During a typical winter season, it’s common for us to sell 150 homes per month. This means we will witness a significant increase in new construction that we haven’t seen for quite some time and most importantly, an overall increase in home values due to supply and demand. Home prices are increasing right now; it’s already happening! Last October, the average home selling price was $174,546. This October, the average was $201,790, a 14% increase. We are heading in the right direction. LM: How do you keep your business out there to grow your client base? LM: What are some of the most important things you would like our readers to know about your business?